So what exactly is it about Bircher that makes it so appealing? There’s a definite “feel good” factor to eating Bircher in the morning, and perhaps we owe that somewhat to its history as a “healing” food. Long before there were juicers and nut grinders, there was Maximillian Bircher-Benner, a Swiss doctor who used raw food to treat patients at his sanitarium in Zurich. Bircher believed that a healthy life depended on one’s harmony with nature . He also believed in breakfast and in 1900 invented the now famous muesli cereal. Bircher’s original muesli recipe is vastly different from the sugar-coated toasted variety we typically find in the grocery store today. Instead, Bircher combined soaked oats, fruit and nuts with grated apple and lemon juice to create a naturally sweet breakfast cereal designed to energize and heal the body. So what’s so magical about the goods that go into Bircher muesli? Oats have long been credited as a “heart-healthy” food because its high levels of fiber, manganese, selenium and magnesium have been shown to help lower blood LDL cholesterol (the “bad” cholesterol). Also, the carbohydrates in oats are absorbed by the body more slowly than many other grains, so you feel fuller longer. Dried fruit such as raisins and prunes not only sweeten Bircher muesli, but they also provide some well-deserved nutrients and minerals. Raisins in particular have been the object of phytonutrient research primarily for their unique phenol content. Meanwhile, prunes are a good source of fiber, vitamin A, potassium, and copper. 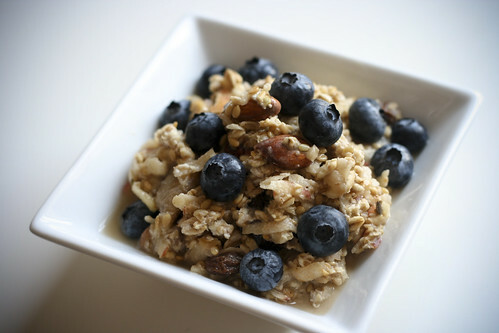 But why stop there; you can use any dried fruit to add flavor and sweetness to your muesli. Apricots are especially good, and are full of dietary fiber and beta-carotene, as well as vitamin A, C, magnesium, iron, calcium, phosphorus, silicon, and potassium. Apples are well known for their health giving properties (“an apple a day…”). They’re a good source of vitamin C and fiber, and are chock full of flavanoids and antioxidants. In fact, early this year, the journal “Nature” reported that natural nutrients found in apples can fight cancer. In fact, study authors say, one apple packs more cancer-fighting antioxidant capability than a 1,500-milligram megadose of vitamin C.
There are many ways to prepare a bowl of Bircher. Some soak the oats in water, while other, more decadent types, use milk or cream. You can vary the fruit and nuts to suit your preference, and a finished bowl of Bircher can be augmented by the addition of yogurt, honey, fresh fruit or toasted nuts and seeds. The following Bircher muesli creation is my go-to recipe, but feel free to experiment with different permutations of fruit, nuts and toppings. The night before you plan to breakfast, soak the oats, flax seeds, almonds, raisins and prunes in just enough water (or milk) to cover. In the morning, mix the above with the lemon juice, apple and cinnamon. Serve with toppings such as fresh fruit, yogurt, or honey. Serves 2. Per serving: 398 Calories; 11g Protein; 12g Total Fat; 68g Total Carbohydrates; 0mg Cholesterol; 7mg Sodium; 12g Fiber. I made the muesli from http://www.spacekadet.org/archives/2006_10.html“ rel=”nofollow”>this post, assuming that the Monica there was you. For that recipe, I had some points of puzzlement. “Apricots”, for example: I have on hand quite a few fresh apricots, but the more I thought about the recipe, the more I was convinced that “apricots” should be “dried apricots”. I also wondered about the wheat bran and finally did substitute oat bran—so that, together with the rolled oats, I got the benefit of whole-grain oats. And in addition to the cinnamon (very good for diabetics), I added turmeric (very good as a general anti-inflammatory). I like the recipe above because it uses a whole apple. The one at the link calls for half an apple—and what do you do with the other half? You eat it, of course. Another addition I made was pumpkin seed: very nutritious and seems to fit with the spirit of the dish. Tomorrow I’ll try the recipe above (but with pumpkin seed, 1/2 tsp cinnamon (the amount recommended for diabetics), and turmeric). And I want to try it with oat groats instead of rolled oats at some point. What, exactly, are “jumbo” oats? Do you mean oat groats? rolled oats? steel-cut oats? Let me know how your next batch goes. I’m addicted to this stuff and love to hear how other people do it! I’ll keep you posted. 🙂 The turmeric does make it come out colorful. If the oat groats are too chewy by half when used raw, I think I might cook them and store them in the fridge. Not exactly in the spirit of the raw cereal, but still nutritious, I think. http://alivewithrawfoods.blogspot.com/2008/01/raw-oat-groat-cereal-recipe.html“ rel=”nofollow”>Raw Oat Groat Cereal. For those of you wondering what’s up with the oat GROATS, versus just plain old rolled oats… rolled oats are typically heat-treated to stabilise them so they don’t go rancid. As a result, rolled oats aren’t really considered a raw food. But this should discourage raw purists from hitting the bircher. You can still make the stuff using raw oat groats or buckwheat groats in place of rolled oats.